12 piste(s) Trance sur 121 MusicStore, en MP3 HD et sans DRM. [En] December 10, 2009 (New York, NY) Internationally renowned artist, visionary producer, film composer and technologist BT is back with THESE HOPEFUL MACHINES, a double-disc opus that carries listeners through 2 hours of sweeping orchestral arrangements, pulsating electronic beats, heartfelt vocal melodies and even simple acoustic guitar. Out February 2, These Hopeful Machines embodies BT?s ability to weave both his technical prowess and compositional mastery that reminds listeners why he is the composer that all other composers and producers study. These Hopeful Machines is the follow up to 2006?s This Binary Universe, an album that created an entirely new genre of evocative electro-acoustic music. Keyboard Magazine wrote in a review, ?In a hundred years, it could well be studied as the first major work of the new millennium. It’s that good.? These Hopeful Machines continues to evolve BT?s distinct technical, lyrical and compositional vision and execution, but his usual melodic complexity and bleeding-edge electronic techniques permeate the album from start to finish. Album opener and ?Suddenly? opens to a minute’s worth of glitchy breakbeats made using BT’s own software, Breaktweaker, before morphing into a powerful, guitar-driven anthem that is among the album’s most memorable songs. The track ?The Emergency,? is instantly a classic BT dance hit designed to linger long after the song ends. The album even features BT’s first cover, a reinterpretation of ?The Ghost in You? by The Psychedelic Furs. The song was recorded on tape, giving it a familiar and sentimental feeling while maintaining BT’s distinctive style. There are also multiple collaborators on This Binary Universe, like Rob Dickinson vocals on ?Always? and ?The Unbreakable,? JES, (formerly of Motorcyle) on ?Every Other Way? and ?The Light In Things,? and The Police?s Stewart Copeland who lends a drum breakdown to ?Every Other Way.? From an early age, BT, born Brian Transeau, demonstrated a remarkable aptitude for playing and understanding classical music. He was heavily influenced by avant-garde and romantic composers such as Stravinsky, Bartok, Debussy and Rachmaninov. His biggest influences, however, were from everyday sounds that most would take for granted, from noticing the meter of the grandfather clock in the foyer to the micro-rhythms of crickets and cicadas to the ambience of passing trains at night. ?When examining my creation process, it makes perfect sense why I am a forced technologist,? he explains. ?I frequently face the fact that the tools I need to compose music simply don’t exist. It is like being an architect without bricks or mortar. I routinely create my own bricks and connective tissue as the diving off point to the compositional process.? The drive to actualize the tools BT envisions has led to his evolution as one of the most cutting-edge programmers and technologists in music today. He has expanded this reach into a visionary software venture, Sonik Architects which launched its critically- and commercially-acclaimed iPhone application, Sonifi?, last fall. Says BT, ?My ultimate goal is to keep the emotional counterpoint and the integrity of the song intact, even when pushing the envelope with style and technique. The faster things get, the less people are willing to take in a body of creative work. There are so few things now that will engage us. The intent of consuming music is usually to have an awareness or a feeling, to have a truly, empathic connection to others. My hope is to create something that makes people feel that they have consumed something that completes a void. I want to create something lasting.? 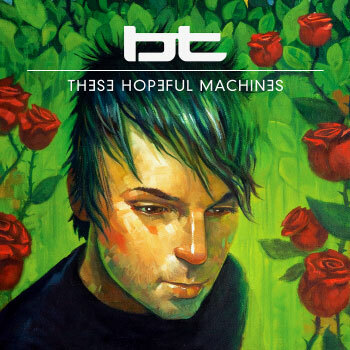 La description de l’album These Hopeful Machines de Bt n’est pas disponible actuellement. Commentez cet album et gagnez des cartes de téléchargement gratuit et/ou des Ipods Apple.